Freeport Area Library patrons can access this site with their eBook library card number. 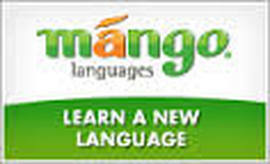 Mango Languages offers 60 foreign language courses and 17 English courses, taught completely in the user's native language. The instruction focus is vocabulary, pronunciation, grammar and culture. A variety of speciality mini courses are offered in Pirate, Medical Spanish and romance.